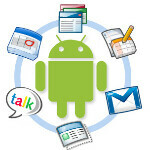 Google pushed out two targeted updates for today for a couple of its own Android apps: Gmail and Google Play Books. Each update was targeted at specific versions of Android. Gmail's update targeted Honeycomb tablets with a small addition for Froyo and Gingerbread handsets, whereas the Google Play Books update targeted Froyo and Gingerbread handsets. The bulk of the updates to Gmail are aimed at giving Honeycomb tablet users the "Android 4.0 (ICS) experience" by adding swipe gestures to move to next and previous messages, the dropdown label menu when tapping the account bar at the top, setting custom notifications for specific labels, and syncing up to the past 30 days worth of messages for use offline. Froyo and Gingerbread users get a minor bump with new API labels for 3rd-party devs and general performance improvements, but those updates won't really change much for the end user right away. The update for Google Play Books is looking to bring some of the more advanced features we've seen in ICS to Froyo and Gingerbread handsets. The update adds a new 3D UI for your bookshelf, as well as a 3D page-turn animation when reading. In-book searching can now be performed offline, there is a new homescreen shortcut available to bounce you straight into the book you're reading, and the screen will stay on when the app is reading to you with TTS. Not bad updates, and if you want them, probably best to go to the Google Play Store on your device to update, and you'll find both Gmail and Google Play Books right there for you.